Our official magazine, now in its 35th edition, is ready to share interesting insights on the Nikon D3, the Custom Brackets at work, and our Nikonians Academy. 7th ANPAT Memories; Grand Prize winners from of our 100,000 Member Celebration Party; Updates on Nikonians Photographer of the Year Contest; Nikonian Victor Newman's (vfnewman) account of his hands on review of the Nikon D3 at a NASCAR race; a sneak peek inside a recent Nikonians Academy workshop; New from Nikon- The COOLPIX line-up expansion and a Custom Brackets Review by Nikonians co-founder J. Ramón Palacios (jrp). For our members who look on enviously at the professional Nikon Digital SLRs equipped with WiFi; the Eye-Fi levels the playing field. It's a combination 2GB SD card equipped with an 802.11g transmitter capable of uploading images to a local PC or to select online photo services such as Flickr, Photobucket or Shutterfly. The card will be available via Amazon as early as Tuesday this week. Entries by Nikon USA personnel on a popular mailing list indicate that a limited time offer for a full version of Capture NX will accompany each D3 and D300 Digital SLR. In essence, each body will be bundled with an activation code for the proprietary RAW processing software. This has been one of the major complaints about Nikon in the past, as competitors (including Canon) have bundled their converters at no extra cost. Our 100,000 Member Celebration Party continues -- with random drawing prizes donated by our Nikonians PhotoProShop. David Summers (dm1dave), Silver member, from Lowden, Iowa, United States; with his Nikon D80 shoots mainly Generic nature. His profile description: Intermediate photographer. Martin Turner (Martin Turner) , Silver member, from Birmingham, England, Great Britain (UK); with his Nikon D2X shoots mainly Press. Gaylon Holmes (Holmes375), Silver member, from Wyoming, United States, with his Nikon D80 shoots mainly Generic nature. Anthony Manansala (avm247), moderator, from Rancho Cordova, California, United States; with his Nikon F100 shoots mainly Architecture. His profile description: Advanced Amateur photographer. Roger Bunting (Drbee), Silver member, from Illinois, United States; with his Nikon D200 shoots mainly People. Neil Rothschild (nrothschild), from United States; with his Nikon D2H shoots mainly Wildlife. Mark Duenas (crazyb3e), Silver-trial member, the USA, with his Nikon D40 he's been having a lot of fun. His profile description: beginner photographer. Our Celebration Week raffle from the PhotoProShop will soon announce the winners of three Markins Q3 ball heads. All Silver, Gold and Platinum members are automatically eligible and entered in the raffle. The Nikonians community, formed in 2000 by co-founders Bo Stahlbrandt and J. Ramón Palacios is an international family composed of Nikon photographers from all walks of life, ages spanning from teens to seniors and experience levels from beginners to celebrated professionals. The community history is available online. Nikonians has rapidly grown to more than 70 forums, some now in multiple languages and now features Podcasts, newsletters and eZines to serve its now more than 100,000 members. The Party has started with good news for three lucky members. Our Nikonians 100,000 Member Celebration has kicked off with the official announcement of the winners of three prizes, courtesy of event sponsor Nikon-Europe. 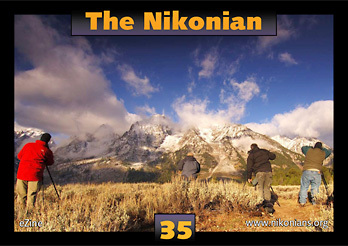 The First Prize, a Nikon D200 DSLR Body goes to: Mark Foley, (mdfnikon), Silver member, beginner, from New Jersey, USA. The Second Prize, a Nikon D40x DLSR Body with AF-S DX 18-55mm/3.5-5.6G ED II Lens and a Crumpler CF-EU03 backpack Goes to Emma Wagner (emmawagner) is from Swindon, England, Great Britain (UK). Emma tells us she shoots mainly people and is a beginner photographer. The Third Prize, a Nikon High Grade 10x25 HG L DCF Binocular, will soon be delivered to Stefan Cook, (stefanjc), Gold member from Gloucester, England, Great Britain (UK). Stefan shoots mainly generic nature with a D200. The three winners will receive their grand prizes courtesy of our 100,000 Cleberation Week event sponsor Nikon Europe. They were chosen through a random drawing of Silver, Gold and Platinum level members and are the first of many to benefit from the Nikonians 100,000 Member Celebration party. Additional winners will soon be announced, gathering prizes donated by HP, Markins and the Nikonians PhotoProShop. PhotoProShop joins in with free prizes! To kick off our Celebration Week our PhotoProShop will soon announce the winners of a raffle for three Markins Q3 ball heads. The good news is that all Silver, Gold and Platinum members are automatically eligible. In addition, Our PhotoProShop staff has been supplied with a generous supply of free gifts with instructions to add them to all orders placed between October 23 and November 1. Listen as the Image Doctors go back in time and discuss the Nikon F3, followed by a discussion of how to simplify your shooting. Jason and Rick also discuss the major camera settings for Nikon DSLRs and how to set them up to get great photos in the field. Our colleagues at Imaging-Resource report on a recent InfoTrends survey showing Adobe Camera Raw is the most preferred way to digitally post-process. By contrast, Nikon Capture NX came in a distant fourth and fifth on Windows and Macintosh systems respectively. Nikon's Digital SLR cameras are rated #1 by JD Power & Associates in a recent 2007 Customer Satisfaction Survey. The brand tallied 822 out of a possible 1,000 points. Congratulations Nikon! At Photo Plus Expo in NYC this past weekend, Nik Software announced the 3.0 upgrade of Color Efex Pro; their award-winning collection of photographic filters. The main draw is the appearance of the proven U-Point technology pioneered in DFine and Nikon's Capture NX. The add-on will be available for both Photoshop and Photoshop Elements and will continue to be sold in tiered Complete, Select and Standard Editions. Tamron sees a November re-launch for it's first Vibration Compensation (VC) lens, the 28-300mm XR DI. Canon users will get first crack, with the Nikon mount available in Spring 2008. Tune in for your weekly dose of Nikonians News Flash! Chock full of news from your friendly neighborhood Nikonians Community! Olympus gets back into the pro market with new releases! Do you need your LCD?. Nikon gear or Engagement ring. Check out the Fall Specials in the PhotoProShop! 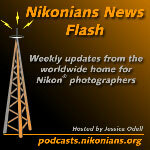 Email Jessica at newsflash@nikonians.org, or drop us a line in the Podcast Feedback forum! A new 8GB capacity Extreme III SDHC media card has been released by Sandisk, with a projected throughput rate of 20MB per second. Each card will be accompanied by a Sandisk-branded Micromate USB 2.0 reader. The card will be available starting in November to US retailers at USD179.99 per unit. Interested buyers can see the card in action at Photo Plus Expo in New York City starting tomorrow 18-October. After a long hiatus, Olympus has re-entered the professional level Digital SLR market with the 10MP E-3. The new camera's features read like a list of must-haves given the competition; dust reduction, sensor-based image stabilization, 5 frames per second, top shutter speed of 1/8000th of a second, 100% coverage viewfinder, TruePic III image processing and a dust/water-proofed mag-alloy body. To address the shortcomings of the previous 3-point AF system in the E-1, the E-3 features a new eleven-cross point module. Unique to the pro tier is a 2.5" rear swivelling LCD which - coupled with the patented Live View system - will allow unique composition opportunities. Also debuting with the new camera are three new pro-tier Zuiko lenses equipped with Olympus' coreless lens motor - the Supersonic Wave Drive (SWD). The ED 12-60mm f2.8-4 SWD, the ED 55-200 f2.8-3.5 SWD and the ED 14-35mm f2.0 SWD will enhance the small but impressive list of E-system lenses currently available. Finally, Olympus addresses the wireless flash system with two new flashguns - the FL-50R and the FL-36R. Another era ended quietly in the US Northeast as Stop & Shop, a ubiquitous grocery supermarket chain, discontinued accepting 35mm film for off-site processing. Tamron's "Make Your Mark" photo contest deadline is just two weeks away. All it takes is a prize winning image of a natural or manmade landmark. This is you chance to win a Tamron AF18-250mm F/3.5-6.3 Di II Aspherical (IF) Macro zoom lens and have your winning shot published. October 12, 2007, Commack, NY -- It's your last chance to enter the Tamron User 2007 Photo Contest. Take a picture of a natural or manmade landmark from anywhere on the four corners of the globe and submit it to Tamron's 2007 Photo Contest: "Make Your Mark: Photographing Natural or Manmade Landmarks Around the World." The Make Your Mark grand prize winner will receive a magnificent Tamron AF18-250mm F/3.5-6.3 Di II Aspherical (IF) Macro zoom lens in any D-SLR mount available and have his or her winning image showcased in Tamron's Viewfinder magazine and on the Gallery section of the Tamron website. Up to 20 runners-up will also have their winning images published on the website for all to see. Tamron is a leading manufacturer of lenses for photographic, industrial, laboratory, video, digital and scientific applications. Among its many optical and mechanical innovations since the start of the company in 1950, Tamron's development of mass produced hybrid aspherical elements in 1992 paved the way for high ratio zoom lenses. The technology was incorporated into the ground-breaking 28-200mm and continues with the new 18-250mm developed exclusively for use on digital SLR cameras and featuring an unprecedented 13.9X zoom range. Nikonians who have enjoyed the color calibration hardware and software capabilities of the Spyder2 Colorimeter will soon have a chance to try out the new Spyder3 from Datacolor. The new calibration unit is smaller and faster than its Spyder2 predecessor and is supplied with a desktop cradle that doubles as a tripod attachment for use when calibrating a display. The new model should be available next month. Zürich, 16th October 2007-- Datacolor, a global leader in digital colour management technology, today announces several products incorporating Spyder3, its next generation of monitor calibration device aimed at photographers and digital imaging professionals needing the most accurate colour for digital editing. Offering an affordable solution, Spyder3Elite incorporates a new suite of features for increased accuracy and performance and enables users to calibrate multiple studio displays to a single target. With its sleek design, the Spyder3 measurement device is 37 per cent smaller than its Spyder2 predecessor and is supplied with a desktop cradle that doubles as a tripod attachment for use when calibrating a display. Suction cup and counterweight mounting options are also provided for complete flexibility. Calibration time is cut by 29 per cent to five minutes, with re-calibration at only two and a half minutes, which is 64 per cent faster than the previous model. The new Spyder3 colorimeter offers the only seven-detector colour engine on the market, with its 27mm aperture, the largest in its class, giving a greater screen sampling area and a 400 per cent increase in light sensitivity. In conjunction with the embedded ambient light sensor, which automatically measures surrounding ambient light levels even when stored in its cradle, Spyder3 enables users to achieve the most precise results when calibrating a display, or multiple displays matched to a single target. Spyder3's optical design and colour engine enable calibration of the latest in wide gamut, LED backlight and AdobeRGB displays. Spyder3 also introduces SpyderProof, a proofing function that lets users evaluate calibration results in before and after modes. Four quadrants of thematic images are displayed, targeting saturated colours, skin tones, gradients and black and white. Users can zoom in on any picture to assess highlights, shadow, colour or tonal response in greater detail, and softproof the images using custom profiles. 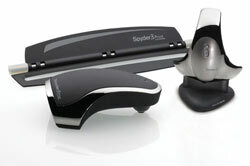 Spyder3Elite's dual-mode software offers the choice of a walkthrough wizard guide or expert console to give advanced users full control of all settings. It is also the only device in its category able to calibrate front projectors. Users can calibrate multiple studio displays to a single target with Spyder3Elite, which incorporates StudioMatch Assistant for step-by-step guidance through the process. The assistant takes into account each display's white and black luminance as well as studio light conditions, guaranteeing consistent and accurate colour and brightness on each display in a studio. Spyder3Elite's Curves Import function gives users total control over colour and black and white tinting curves in the image editor, enabling adjustments to be applied to a profile rather than individual images, while a new PreciseLight function adjusts profiles to optimise images for printing, depending on the environment in which they will be displayed. Unlimited, user-defined calibration targets for white point, gamma, white luminance and black luminance allow users to get the most from their digital workflow. Creatives using L-Star workflows can use Spyder3Elite's patented L-Star compatible technologies as an alternative to typical gamma settings, enabling individual tonal response curves to be generated for open shadows and detailed highlights. Once calibrated, the new SpyderCertification option ensures that calibration standards are deployed consistently across all subscribed displays, issuing a warning if a display's calibration becomes out of date or incorrect. With the launch of Spyder3, Datacolor announces that its consumer business unit will now be known exclusively as Datacolor. Previously, the business unit had incorporated branding of both Datacolor and ColorVision, a division of Datacolor since 2000. 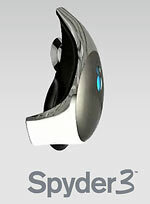 For more information and to purchase Spyder3 products, please visit www.Spyder3.com. Datacolor is a global leader in colour management solutions and colour communication technology. The world's leading brands, manufacturers, creative professionals and consumers choose Datacolor's innovative technology solutions to achieve the right colour consistently. A Swiss-held company, Datacolor's global presence encompasses a sales, services and support network serving customers in more than 65 countries throughout Europe, the Americas and Asia, along with 13 worldwide operation and production facilities. Industries served include photography, apparel and textile, digital imaging, architectural painting, graphic design, automotive, home theatre, furnishing, plastics, printing, coating, paper and others. For more information about Datacolor and its products or services, visit www.datacolor.com/Spyder3. Spyder3, SpyderProof, SpyderCertification, StudioMatch and PreciseLight are trademarks of Datacolor. Geo-tagging, or the practice of overlaying your photos onto a geographical map to show where it was taken, has been quite popular for some time now. GeoPic II is one of the first commercial releases to claim both a dedicated role as a geo-tagging device and features low power consumption. With a small physical format and easy integration with Nikon DSLRs such as the D200, D300, D2, D3 and Fuji Finepix Pro series, the GeoPic II works with both JPEG and RAW formats and easily communicates with Picasa, Google Earth and Adobe Lightroom. See D3s being born at the Nikon plant! Sigma updates thier 10-200mm lens. Nikonians celebrates 100,000 Members! Congrats! Forest Glen - Glendalough Ireland. The Image Doctors have returned from the 7th Annual Nikonians Photo Adventure Trip (ANPAT). Hear all about their week in Grand Teton and Yellowstone National Parks. 1:21 7th ANPAT Report: Grand Teton NP and Yellowstone NP Click here to see some of Jason's Photos from the ANPAT. Third-party lens maker Sigma has updated their popular digital-only 18-200mm lens with both Optical Stabilization and HyperSonic Motor. Nikonians now have a closer choice between the Sigma and the Nikon 18-200 DX VR. Nikon has provided some press photos showing the assembly line at the Sendai plant, where the top-end digital SLRs such as the Nikon D3 are being produced. We have hit the 100,000 member mark at the Nikonians community, and for some of those members, great prizes are in store thanks to event sponsor Nikon-Europe. The membership count hit six digits while co-founders Bo Stahlbrandt and J. Ramón Palacios were attending the 7th Annual Photo Adventure Trip (ANPAT) in Yellowstone and Grand Tetons National Parks. Both are now back home, and they have been preparing a random drawing process to select lucky winners of Nikon products and accessories supplied by Nikon-Europe for the event. Topping the list will be a Nikon D200 DSLR Body as First Prize; followed by a Nikon D40x DLSR Body with AF-S DX 18-55mm/3.5-5.6G ED II Lens and a Crumpler CF-EU03 backpack as Second Prize, and a Nikon High Grade 10x25 HG L DCF Binocular for Third Prize. The winners will be announced very soon, so make sure you stay tuned to our News Blogs for updates. DXO releases DxO Optics Pro v5. October's Online Photo Assignment: Change. The ease of which one can publish their photographs in the digital age has resulted in many cautionary tales regarding property rights and usage. The recent flap over Virgin Mobile's inappropriate use of a Flickr photo highlights the need for photographers to really understand their rights and exercise due diligence when choosing a venue for which to showcase their work.